calorie restricted state and activate genes that repair DNA and cellular structures. Activate Yourself using the Recent Advances in Anti-Aging Science. In the below article, they show that the active ingredient in benaGeneTM, oxaloacetate, increases lifespan in a manner similar to that seen in the calorie restricted metabolic state. Williams DS, Cash A, Hamadani L, Diemer T.
Departments of Pharmacology and Neurosciences, UCSD School of Medicine, La Jolla, CA 92130, USA. Summary Reduced dietary intake increases lifespan in a wide variety of organisms. It also retards disease progression. They tested whether dietary supplementation of citric acid cycle metabolites could mimic this lifespan effect. They report that oxaloacetate supplementation increased lifespan in Caenorhabditis elegans. The increase was dependent on the transcription factor, FOXO/DAF-16, and the energy sensor, AMP-activated protein kinase, indicating involvement of a pathway that is also required for lifespan extension through dietary restriction. These results demonstrate that supplementation of the citric acid cycle metabolite, oxaloacetate, influences a longevity pathway, and suggest a tractable means of introducing the health-related benefits of dietary restriction. In the below article, they review not only our previously published work, but also the work of many other researchers that document the ability of oxaloacetate supplementation (benaGeneTM) to reduce fasting glucose levels, it's action as a powerful antioxidant, protection of mitochondrial DNA (a big plus), and protection of eye, brain and pancreas tissues. We further provide a case study of a 73 year old woman who reduced and stabilized her glucose levels by taking benaGeneTM. In 75 days she reduced her fasting glucose levels by 24%, reduced her insulin resistance by 34%, and reduced the amplitude of her glucose "swings" by 55%. Persons with normal glucose functioning will see an increase in glucose uptake by the muscle tissue, and only a small drop in fasting glucose levels, but will still see the glucose stabilization effect. The paper documents how supplementation with oxaloacetic acid (benaGeneTM) acts to mimic at least some of the benefits of the calorie restricted state. "Oxaloacetic Acid Supplementation as a Mimic of Calorie Restriction." To see this article, click on the "Hot Topic- Calorie Restriction Mimetics" link and then download the free article. The reduction in dietary intake leads to changes in metabolism and gene expression that increase lifespan, reduce the incidence of heart disease, kidney disease, Alzheimer's disease, type-2 diabetes and cancer. While all the molecular pathways which result in extended lifespan as a result of calorie restriction are not fully understood, some of these pathways that have resulted in lifespan expansion have been identified. Three molecular pathways activated by calorie restriction are also shown to be activated by supplementing the diet with the metabolite oxaloacetic acid. Animal studies supplementing oxaloacetic acid show an increase in lifespan and other substantial health benefits including mitochondrial DNA protection, and protection of retinal, neural and pancreatic tissues. Human studies indicate a substantial reduction in fasting glucose levels and improvement in insulin resistance. Supplementation with oxaloacetic acid may be a safer method to mimic calorie restriction than the use of traditional diabetes drugs. 1. Williams, D.S., et al., Oxaloacetate supplementation increases lifespan in Caenorhabditis elegans through an AMPK/FOXO-dependent pathway. Aging Cell, 2009. 8(6): p. 765-768. 2. Desagher, S., J. Glowinski, and J. Premont, Pyruvate protects neurons against hydrogen peroxide-induced toxicity. J Neurosci, 1997. 17(23): p. 9060-7. 3. Desagher, S. and J.C. Martinou, Mitochondria as the central control point of apoptosis. Trends Cell Biol, 2000. 10(9): p. 369-77. 4. Bhattacharya, R. and R. Tulsawani, In vitro and in vivo evaluation of various carbonyl compounds against cyanide toxicity with particular reference to alpha-ketoglutaric acid. Drug Chem Toxicol, 2008. 31(1): p. 149-61. 5. O'Donnell-Tormey, J., et al., Secretion of pyruvate. An antioxidant defense of mammalian cells. J Exp Med, 1987. 165(2): p. 500-14. 6. Puntel, R.L., C.W. Nogueira, and J.B. Rocha, Krebs cycle intermediates modulate thiobarbituric acid reactive species (TBARS) production in rat brain in vitro. Neurochem Res, 2005. 30(2): p. 225-35. 7. Puntel, R.L., C.W. Nogueira, and J.B. Rocha, N-methyl-D-aspartate receptors are involved in the quinolinic acid, but not in the malonate pro-oxidative activity in vitro. Neurochem Res, 2005. 30(3): p. 417-24. 8. Yoshikawa, K., Studies on the anti-diabetic effect of sodium oxaloacetate. Tohoku J Exp Med, 1968. 96(2): p. 127-41. 9. Cash, A., Oxaloacetic Acid Supplementation as a Mimic of Calorie Restriction. Open Longevity Science, 2009. 3: p. 22-27. 10. Yamamoto, H.A. and P.V. Mohanan, Effect of alpha-ketoglutarate and oxaloacetate on brain mitochondrial DNA damage and seizures induced by kainic acid in mice. Toxicol Lett, 2003. 143(2): p. 115-22. 11. Greer, E.L., et al., An AMPK-FOXO pathway mediates longevity induced by a novel method of dietary restriction in C. elegans. Curr Biol, 2007. 17(19): p. 1646-56. 12. Wood, J.P. and N.N. Osborne, Zinc and energy requirements in induction of oxidative stress to retinal pigmented epithelial cells. Neurochem Res, 2003. 28(10): p. 1525-33. 13. Chang, I., et al., Pyruvate inhibits zinc-mediated pancreatic islet cell death and diabetes. Diabetologia, 2003. 46(9): p. 1220-7. 14. Zlotnik, A., et al., Brain neuroprotection by scavenging blood glutamate. Exp Neurol, 2007. 203(1): p. 213-20. 15. Farah, I.O., Differential modulation of intracellular energetics in A549 and MRC-5 cells. Biomed Sci Instrum, 2007. 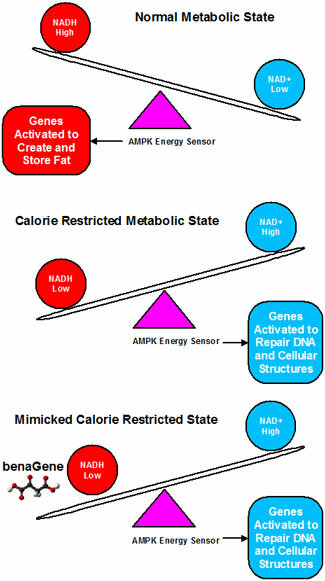 43: p. 110-5.
benaGeneTM works through the energy sensor AMPK to mimic the calorie restricted state and activate genes that repair DNA and cellular structures. Why should I take benaGene? 1) Within the last five years, there have been several studies by major universities documenting that an increase in the NAD+/NADH ratio results in statistically significant increases in lifespan and health-span in laboratory animals. Equally as exciting, this same increase in the NAD+/NADH ratio has also been shown to increase individual human cell lifespan in vitro. 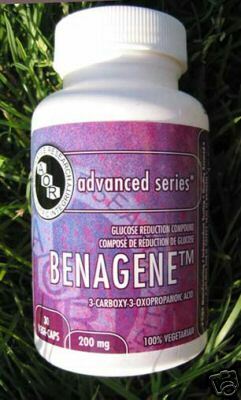 benaGene is a bio-identical human metabolite that increases the NAD+/NADH ratio, and has been proven to result a 25% increase in lifespan in laboratory animals (p < 0.001). Health-span of the animals is also remarkably increased. 2) Clinical trials using oxaloacetate have documented significant glucose level reductions in diabetic patients. A separate study in non-diabetic patients documented a reduction in the amplitude of glucose swings, allowing better overall blood sugar management. No negative side effects were reported. Although benaGene lowers high glucose levels, it does not cause hypoglycemia (abnormally low glucose levels) in non-diabetic patients. 3) benaGene is a powerful anti-oxidant, and has been shown to protect neurological tissue, pancreatic tissue and eye tissue. 1) Reduction in sugar cravings. 5) Reduction in the ability to create and store fat. Individual results may vary. If I am taking resveratrol, should I also take benaGene? Resveratrol is thought to work by stimulating the Sirtuin proteins which use NAD+ as a substrate. benaGene works by making more NAD+ available. The two compounds can work synergistically. Is there proof that benaGene increases Lifespan? Yes, but only in animals. To properly conduct a statistically valid test in humans, we would need 130 years. Note that calorie restriction has also not been proven in humans, but has been proven in yeast, worms, flies, guppies, spiders, mice, rats, dogs, and a 20-year study just confirmed that monkeys also live significantly longer (and healthier) under calorie restriction. Human populations that have undergone reduced calorie consumption (without stavation) also have higher percentages of persons over 100 years old. Calorie Restriction (CR) is the reduction in the overall amount of calories (by 25 to 50%) while maintaining proper nutrition. It is a proven method to extend the lifespan of all tested species. CR has been shown successful on a wide range of organisms, from single celled to very complex (including monkeys). The wide range of success of CR indicates that the process of life extension is based on effects within the individual cells of the organisms, and that the process allowing lifespan extension is preserved across species. The benefits of CR are numerous. In addition to lifespan extension, the onsets of aging-related diseases are also delayed, leading to a healthier organism for a longer time. In mammals, CR delays kidney disease, autoimmune disease, and type II diabetes. CR reduces age associated neuron loss in mouse models of Parkinson's disease and Alzheimer's disease. It is also noted that even moderate CR lowers cancer risk in mammals. Additionally, CR mammals have been observed to have less body fat. CR has been shown to enhance the repair of DNA in skin and other tissues after exposure to ultraviolet light. DNA repair is critical for skin repair and to prevent skin aging. It also reduces skin cancer incidence. Studies of humans undergoing CR for 3 to 15 years have shown reduced risk for atherosclerosis along with reductions in fasting glucose, fasting insulin, Hs-CRP levels, systolic and diastolic blood pressure, triglycerides, total cholesterol, and LDL cholesterol as compared to equivalent age-matched controls. Kubova et al, How does calorie restriction work? 2003 Genes & Development. Vol. 17 pp 212-221. Lin, S. et al, Calorie restriction extends yeast life span by lowering the level of NADH. 2004 Genes & Development Vol. 18 pp 12-16. * Based on Published Laboratory Research in Animals.